Whisky was almost certainly brought to Scotland from Ireland by monks but ever since it arrived it has been part of Scottish culture and entwined with its history. The first official mention of whisky in Scotland is in 1494 regarding Friar John Cor making aqua vitae (the water of life) by order of the king. But by 1505 whisky production was in the hands of barbers, certainly in Edinburgh where they were granted the right to distill. Whisky has come a long way since then when it would probably have been distilled only once and been drunk from stone or glass jars as a clear rough spirit or mixed with honey and herbs to disguise the harsher notes – this is where whisky liqueurs originate. From monks to barbers, to a time where every croft and farm had its own still to turn excess barley in to whisky during the long dark Scottish winter, and now also when it is mainly in the hands of giant conglomerates. But some distilleries have found their way back in to private hands such as Benromach and BenRiach and they are very innovative in the whisky they produce. Now there is also the return of farm based distilleries such as Kilchoman who seek to make whisky on a small scale but with great passion. Some distilleries are still in family hands like the iconic Glenfarclas and would you believe the biggest selling single malt of them all Glenfiddich. There is such variety out there it is well worth visiting a distillery or two and seeing how the modern rubs shoulders with the traditional. 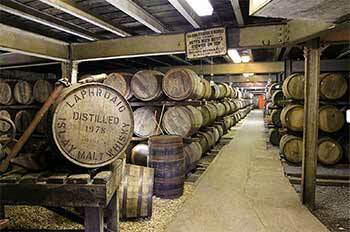 Sometime in the late Eighteenth century whisky started to be stored in wood casks. 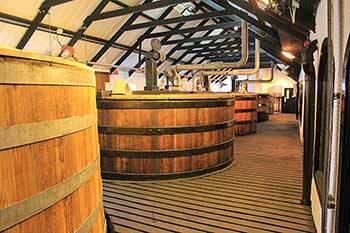 This was for convenience rather than by design but the magic of wood maturation had been discovered. Something like two-thirds or more of the flavour of whisky and the entire natural colour come from the wood. In modern day whisky production the cask is king and the science of wood maturation is well understood. The type of oak (as the wood must be oak), what it was previously used for (the majority of whisky casks are second hand) and the number of times it has been used for whisky is carefully recoded and tracked for each cask to try and ensure the best possible whisky is produced. The State saw distilling as a possible source of income and Oliver Cromwell imposed an excise tax of 2d. a gallon but it was not really controlled until Scotland was subdued after the rebellion. The system of taxation during the 18th century, which was on still capacities, became so repressive that the industry was almost ruined. In 1817 a moderate tax on spirit output was substituted, the legitimate distiller was rehabilitated and the illicit stills, which had been so plentiful, almost disappeared. Five years later a uniform tax per proof gallon was fixed for all Scotland. 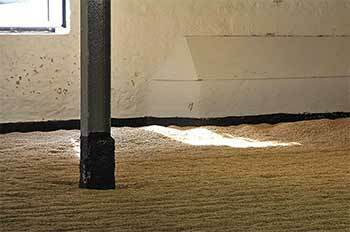 The first process in the making of malt whisky is the malting of the barley. There was a time when barley of poor quality was used but today grain of a more suitable quality is used. Barley is steeped in water for 2 to 3 days, is spread out about two feet thick on a large malting floor and turned every 8 hours by men using large wood shovels to prevent it generating too much heat. Here it germinates and grows for 6 to 10 days to develop as much diastase as possible – that is the conversion of starch into glucose – and a little maltose or malt sugar. The whole mass is gradually moved from one end of the floor to the other. By spreading more thinly germination is slowed and the grain dries and withers. Further development is prevented by kilning. In the older distilleries the kiln building usually has the attractive, characteristic pagoda-like ventilators. 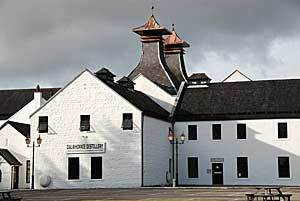 Inside there is a perforated floor on which the germinated grain is spread and below it there is a furnace in which the peat, which gives the flavour to the malt, is burnt. This process takes 3 to 4 days. When dry the malt has a sweet biscuity flavour. The malt grain is passed through a dresser to remove rootlets, coarsely ground, weighed and the grist put into a huge round vat called a mash tun where it is mixed with hot water. 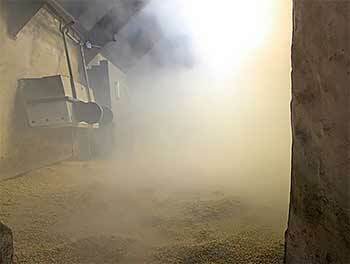 In the mash tun the malting action of the diastase begins again and converts the remaining starch to malt sugar. The (first) water will have extracted most of this maltose from the grain in an hour or so and the liquid, now called wort, is drained into the worts receiver so no maltose is wasted. The tun is refilled with hotter (second) water and again drained into the worts receiver so no maltose is wasted. A smaller third lot of water is used but this is pumped into a store to be used with the next tot of malt. The residue of barley without its starch element is known as draff and is often used as cattle food. The wort is cooled and conveyed to a vat known as a wash back for fermentation. 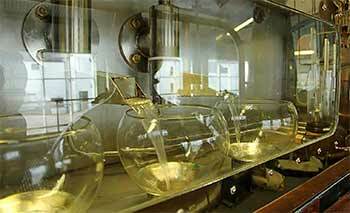 Here yeast is added to convert the maltose to alcohol. Carbon dioxide gas goes to waste in the air and the alcohol remains in solution in what is now known as the wash. After about 36 hours the wash is piped to a large container called a wash receiver. 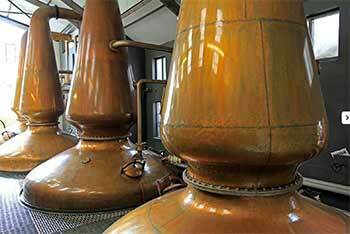 Distilling of this liquid is done in a large onion-shaped copper vessel called a pot still, to which heat is applied in different ways at different distilleries. The wash is brought to the boil and the alcohol being more volatile than steam comes off first and passes up the narrow neck into a condensing coil, or worm, around which cold water flows, the bulk is reduced to about one fifth and the resulting liquid is known as low wines. This impure dilute alcohol is distilled a second time in the production of malt whisky and it is now that the stillman’s skill is vital. The first part of the distillate is too strong and impure, this is called foreshots, and it and the last parts, called feints, are discarded and put into a feints receiver for re-distillation. The residue, spent leys, is little more than water and is run away. The distillate passes through an ingenious glass box, the spirit receiver, securely locked by an excise officer, in such a way that it can be tested without handling or being able to be tasted. Taps outside enable some of the liquid to be turned into glass cylinders in which a hydrometer is floated giving the stillman the specific gravity reading from which he controls the stills. He can also drip in distilled water to test for cloudiness. The very first ‘spirit safe’ is still at Laphroaig Distillery on Islay.